As a wood flooring professional or contractor, you’re well aware that hardwood floors add warmth and beauty to a home . . . increasing their appeal and long life. You also know all too well that if a wood floor’s moisture content (MC) is too high when installed, it could soon show ugly cracks, buckling, and other tell-tale signs of excessive moisture – resulting in a costly call-back, ruined reputation, or even legal claims. Some really good news, however, is that we at Wagner Meters can help you avoid those kinds of headaches. How? Keep reading . 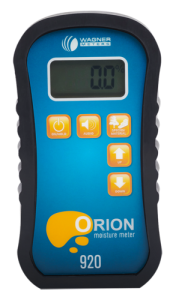 . .
We’re excited to introduce you to our most accurate, technologically advanced, and versatile moisture meters ever developed – Orion. We specifically designed Orion meters to make your flooring installations easier, faster, and way more successful! There are too many features to tell you here, so we’ll just mention those that could have the biggest impact on your business. Dual-depth readings. Orion gives you the best of both worlds – deep and shallow depth readings. The shallow depth feature (1/4-inch or 6.35mm thick) allows you to read MC in thin samples such as wood flooring or to check the dryness of waterborne finishes between each coat to expedite the finishing process. With the deep depth feature (up to 1.5-inches or 38.1mm deep), you can measure moisture in subfloors or thicker materials to check for wet spots or problem areas. On-site calibration. Before you start an installation, it makes good sense to calibrate your moisture meter. It’s critical to know you can trust your instruments are accurate and performing. Bad moisture readings can lead to bad outcomes, and Wagner Meters has taken steps to ensure that bad readings never happen again. Like any electronic device, meters can lose calibration unexpectedly. You drop your meter, it’s exposed to excessive heat or moisture, or it succumbs to everyday use. Now, sure, there are meters that tell you when they need calibration, but you have to ship them to the manufacturer for recalibration. That’s an inconvenience costing you time and money. Not so with Orion. 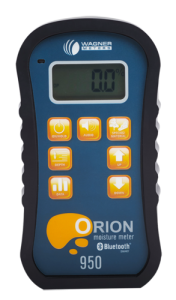 In addition to a protective rubber boot, every Orion moisture meter comes with an On-Demand Calibrator that allows you to calibrate the meter anywhere at any time. It’s exclusive only to Wagner’s Orion moisture meters and takes only a minute. No other meter offers you this time and money-saving convenience along with the assurance of calibrated accuracy for the life of the meter. Non-damaging. 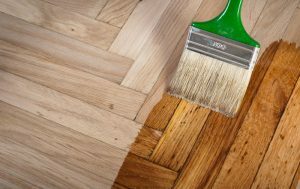 When you install expensive wood flooring – like cherry, oak, or exotic woods like Brazilian walnut or mahogany – you don’t want to punch unsightly holes in them and then have to hassle with filling them in as you do using pin meters. With Orion, you avoid this hassle altogether. Plus, with pinless, you can quickly measure the moisture content of many board feet with amazing accuracy in mere minutes. You complete installations in much less time than if you used a pin meter. Remember the saying: time is money. Data collection. Need to collect and store data on your wood flooring materials? Two of our models allow you to take high/low/average moisture content readings for each job or stack of wood flooring. And, with our FloorSmart™ Bluetooth® app, you can transfer this data in your computer or smartphone and access when needed. Programmable alarm. Every Orion comes with an audible and programmable alarm for high moisture content levels. This is especially useful for measuring subfloors or monitoring areas suspected of having high moisture. Equilibrium moisture content (EMC). Available only in our top model, this feature uses data from the meter’s temperature/humidity sensor and calculates EMC. This is ideal for checking ambient conditions in a room – then letting you know if a wood specimen is at the point of equilibrium with its environment and ready for installation. Industry-best 7-year warranty. While Orion meters are built for exceptional dependability, should you ever have any problems you’re covered up to 7 years. Along with our unparalleled customer service, no other company backs their meters like Wagner. How’s that for peace of mind! Each Orion model offers unique functions and features, so you can pick the meter that best suits your needs. 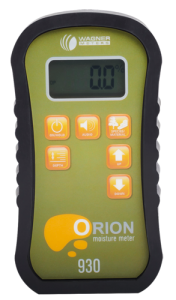 Orion 910, ideal for taking deep depth readings (up to 1.5” or 38.1mm), works great measuring subfloor wet spots or problem areas. Orion 920, with shallow depth readings, is perfect for measuring thin wood (1/4” or 6.35mm), checking individual wood flooring pieces, or checking the dryness of waterborne finishes. Orion 930 offers both deep and shallow depth readings giving you greater versatility in one meter. 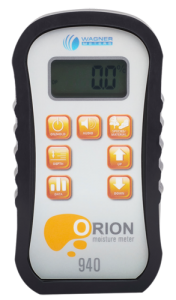 Orion 940 features dual-depth readings plus a data collection capability. Data collection is ideal when dealing with large amounts of wood, enabling you to check the highs, lows, and average MC of your stock. Orion 950, our most advanced model, is perfect for any flooring professional. Equipped with all the functions and features of the meters above, the 950 also features a humidity and temperature sensor that helps you calculate your wood’s EMC. The 950 comes equipped with Bluetooth® technology to connect with our free FloorSmart™ app, available for iOS® and Android™ devices. With the app, you can receive and record data, set specifications for separate jobs, and much more. 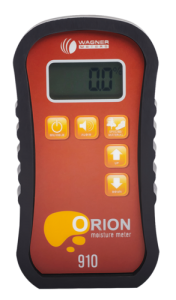 Put an Orion® Meter In Your Hands Today . . .